So now, back to stories from my recent Dubai trip. Before I start, let me tease you with a question: What comes to your mind when I mention the term 'modern Asian diner'? 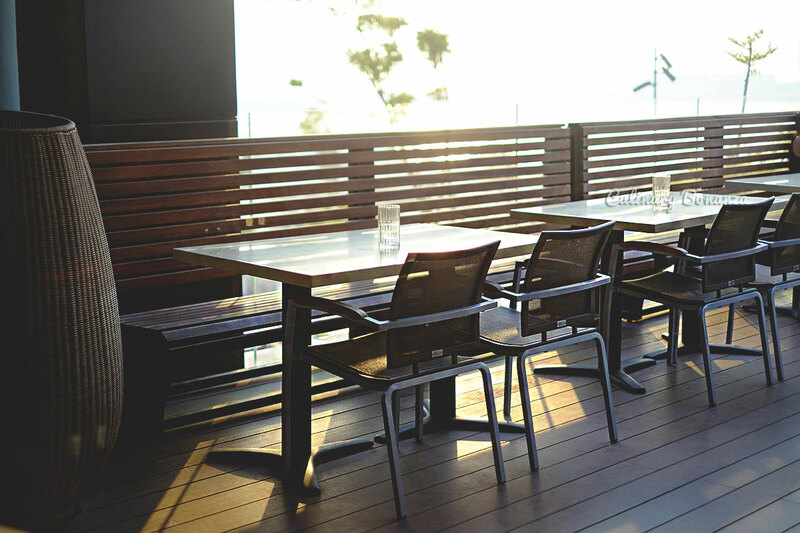 Do you imagine fancy fusion food at high end location, for example several restaurants that already open in Jakarta? 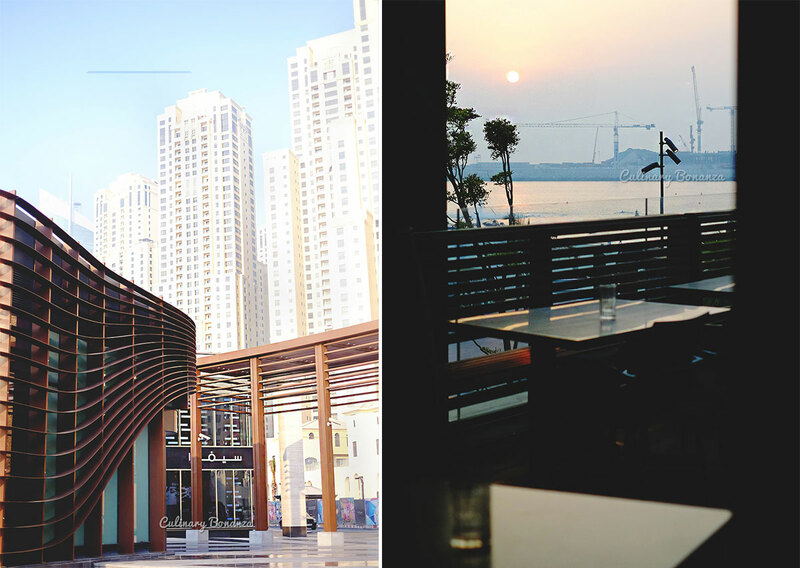 So, in this post, I'm going to share in great detail, my dining experience at one of P.F. 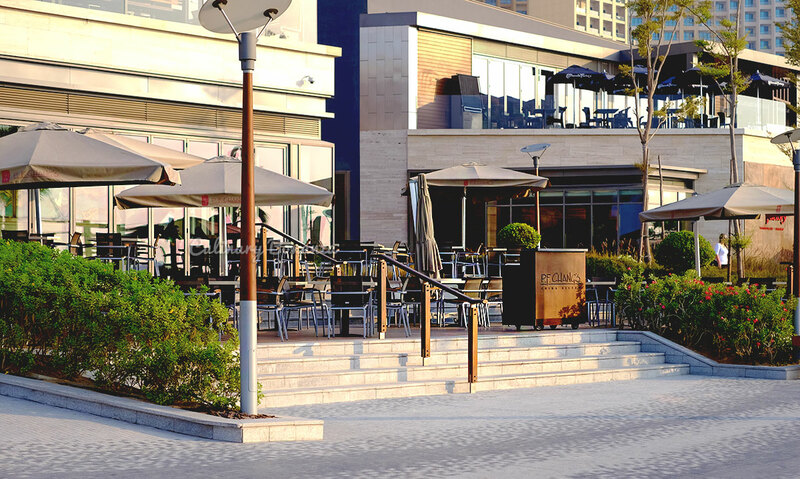 Chang's prettiest branch located The Beach, opposite Jumeirah Beach Residence. Briefly summarised, P.F. 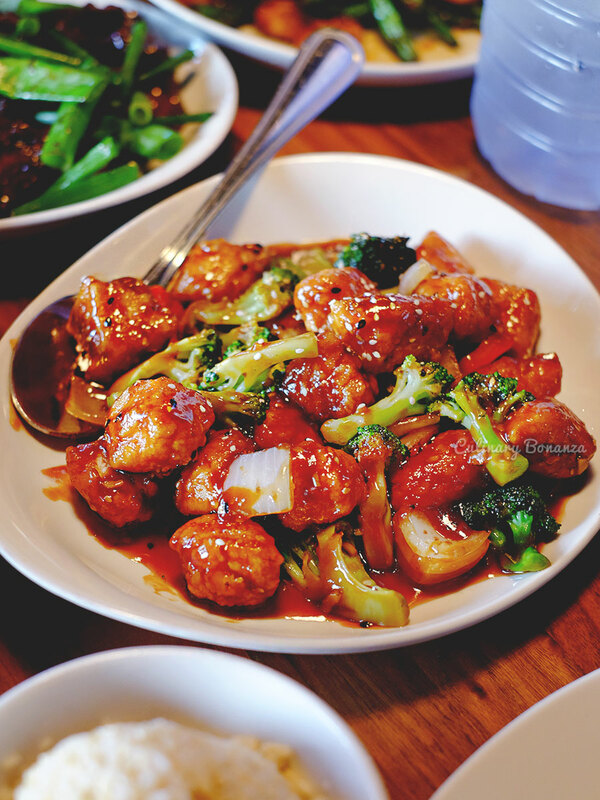 Chang's is an American restaurant chain founded in Scottsdale, Arizona in 1993 by Paul Fleming serving menus conceived by Chef Philip Chiang (whose surname is simplified to Chang), hence the brand: P. F. Chang's. 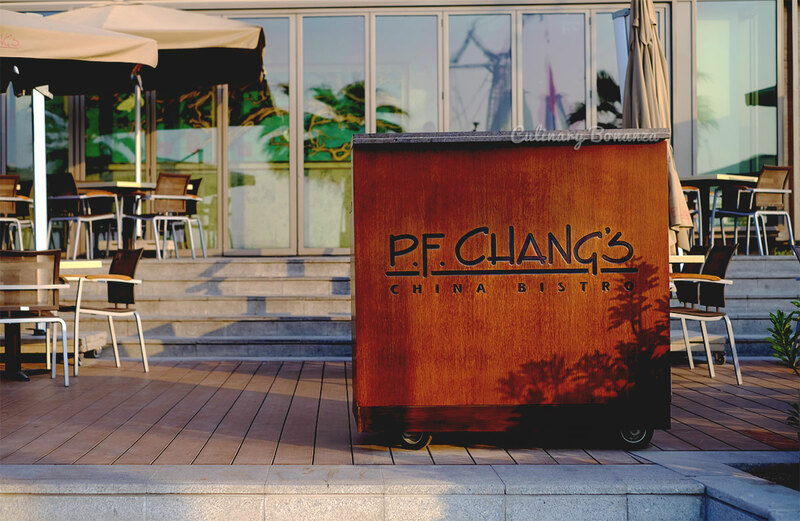 To be honest, I've not heard of the brand P. F. Chang's prior to coming to Dubai, which is run by The Alshaya group, the company that holds the franchise rights of and runs numerous large international brands such as IHOP, Starbucks, Victoria's Secret, H&M, Debenhams, etc in Middle East and North Africa, Russia, Turkey and Europe. 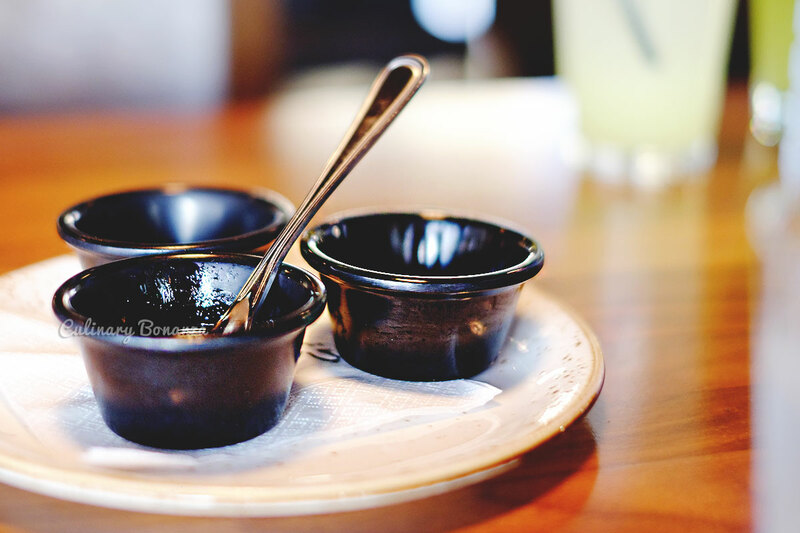 Playing with mainly dark colour, modern wooden furnishing elements and wall mural, the décor and interior of P. F. Chang’s is quite safe and easily appeals to the taste. 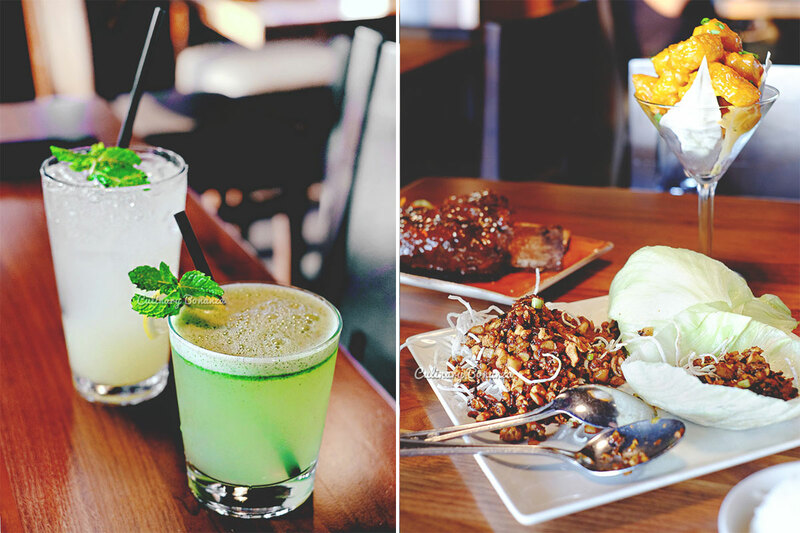 Although, if compared to several modern asian diners in Jakarta, the interior of P. F. Chang’s pales in comparison. 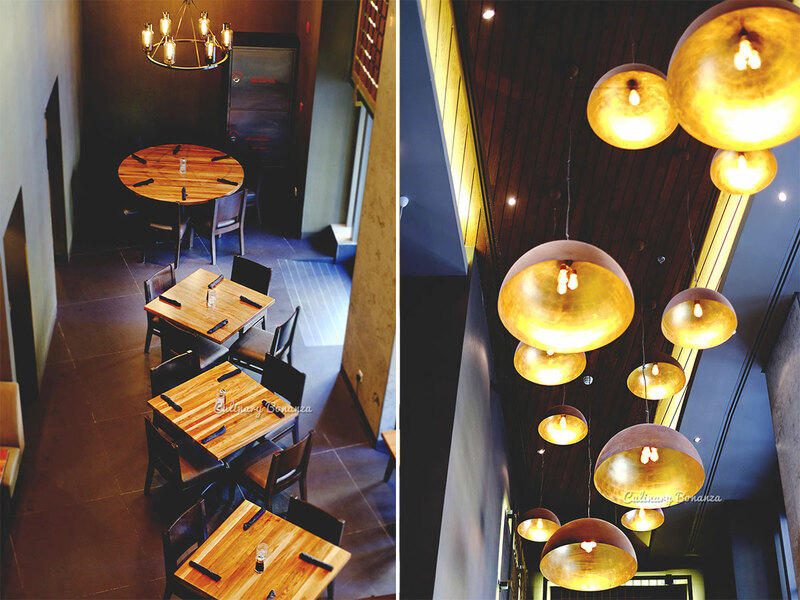 In order for P. F. Chang’s to catch and retain the Indonesian crowd, it needs a really strong, unique and modern interior. Indonesians nowadays don't simply dine out to fill their tummies, they're willing to pay a premium price for one-of-a-kind, never-seen-before kind of dining experience (great food and breathtaking venue). 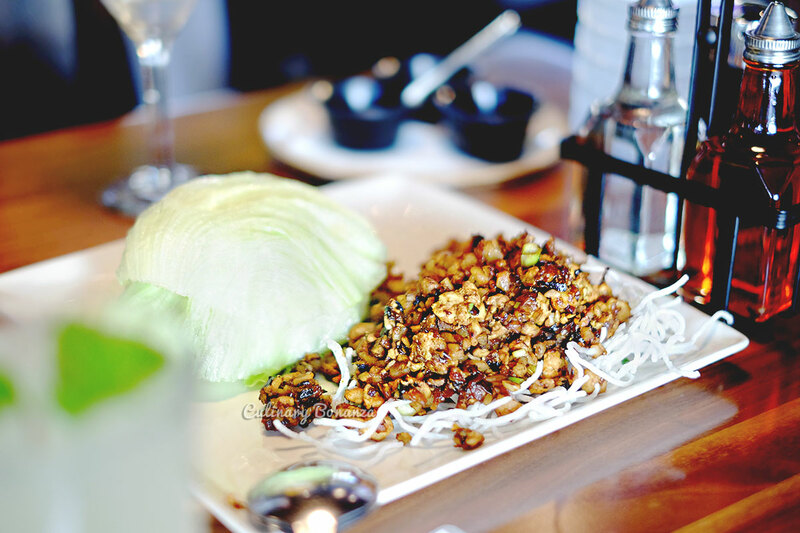 P. F. Chang’s most popular appetizer, stir fried chicken served with lettuce cups. Remarks: lovely diced & stir fried chicken, although the presentation could use some improvement.. 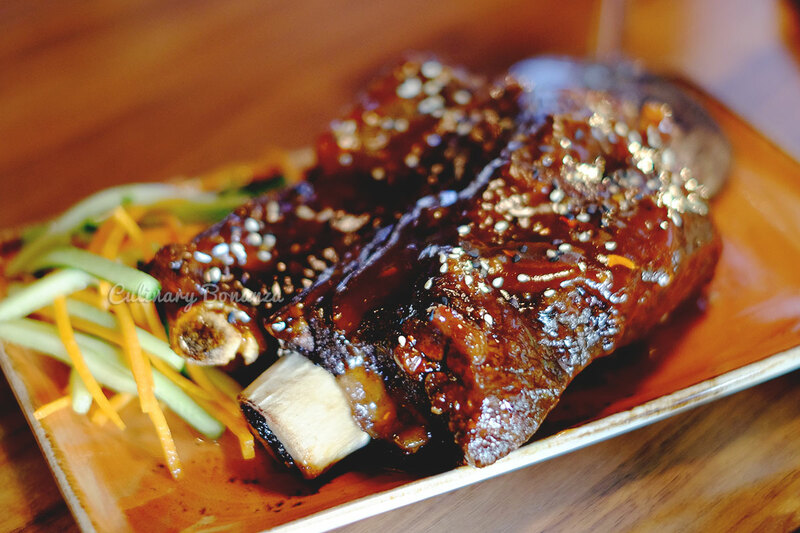 Giant beef rib covered in sweet & savory Asian BBQ sauce paired with cucumber & carrot salad. Great for starter or light meal. Remarks: amazing fall-off-the-bone & meaty short ribs. This kind of amazing ribs is not easily found in Jakarta, even at restaurants that specialize in serving steak, meat & grill. But the serving portion is too much to make it as a starter, even less so if it comes with plain rice. Perhaps just 1 rib of the same size would be enough for a starter. A cup of flavourful battered shrimp with an explosive spicy sauce. Remarks: it’s going to be a hit among Indonesians, so far no other places serve this kind of dish yet. Perhaps could improve on the skin wrapping the shrimp, it would be great if it could be crispy. The seasoning is just enough and serving is unique in a tall cocktail glass. Remarks: delicious tender chicken ‘balls’, well marinated outer ‘skin’. Will be a hit among Indonesians too. Flavour and seasoning are well balanced. Duck legs and breast, steamed and finished on the grill. Served with cucumber drizzled with sesame vinaigrette & julienned scallions. Remarks: it’s unlike any other duck dishes that we’ve seen in Jakarta. 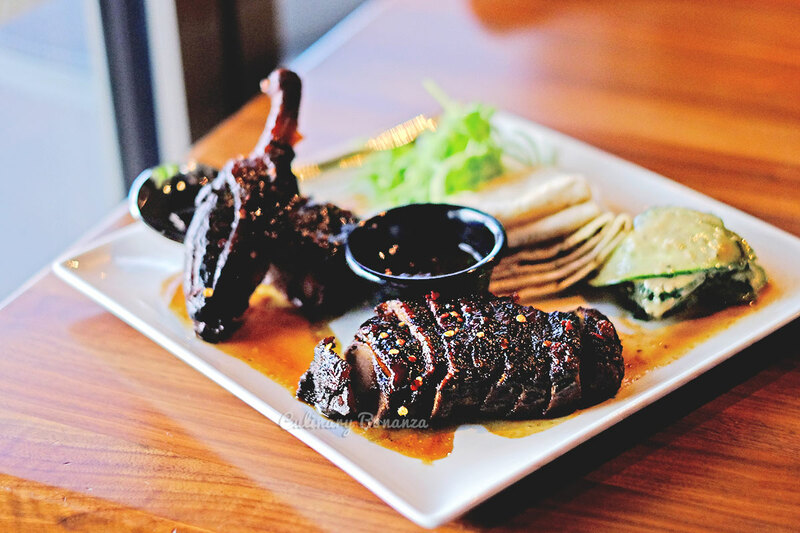 P. F. Chang’s duck is awesome in terms of flavor & meat texture, seasoning & tenderness. Absence of any gamey odour successfully appeal to even non-duck fan like me to love this dish!! The duck certainly deserves a VIP rating. 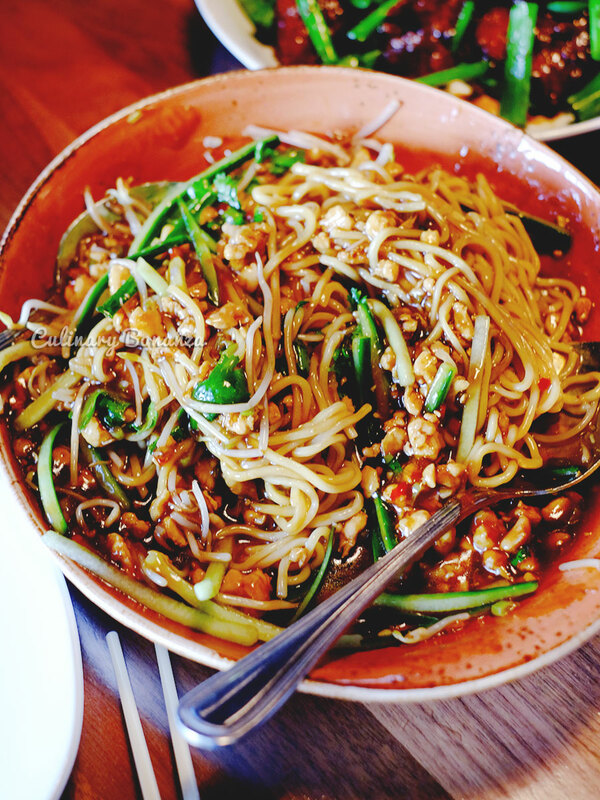 Fresh egg noodles topped with spicy ground chicken & dark sauce, finished with bean sprouts & cold cucumber slices to cool the palate. The dish is tossed upon served at the table. 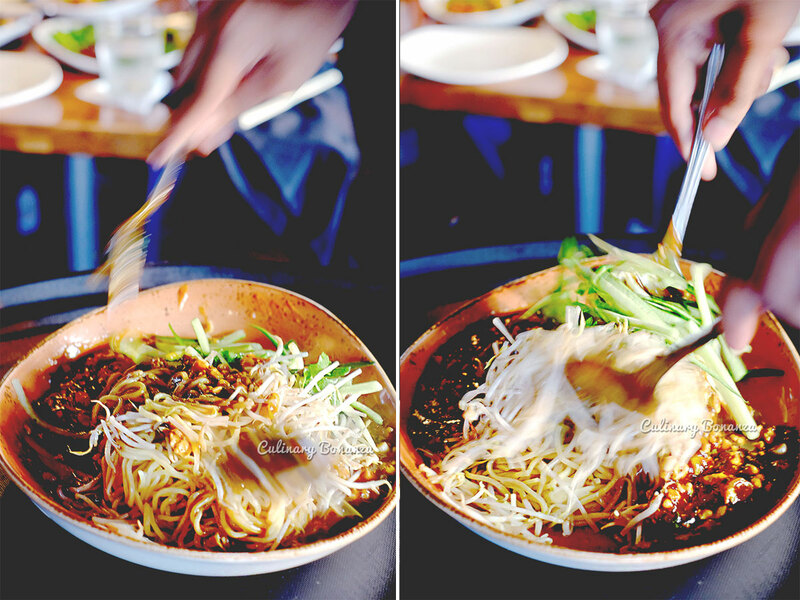 Remarks: I like the concept of having the staff helping to stir the noodles and the wonton broth to the noodles, how he explained that the noodles are not cut to stay true to traditional Chinese belief. But, the noodles are a tad too salty to be eaten without rice. But noodles are not commonly eaten with rice In the first place. Plus the serving is too much in my opinion. 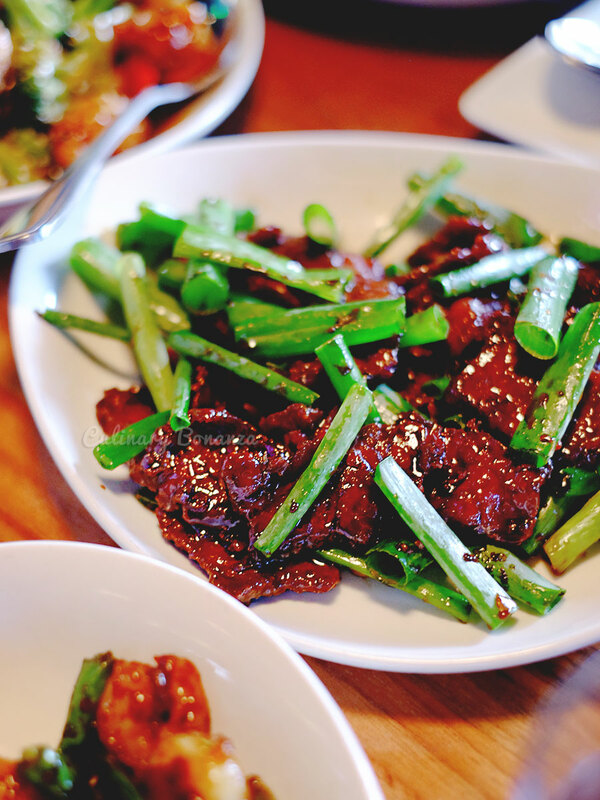 Using traditional recipe from Mongolian region of China, the dish is prepared with thin slices of caramelized beef and tossed with scallions. Remarks: the first attempt was a flop, beef was overcooked and dry. But on second attempt, the beef came out perfect!! Delightfully tender strips, nice caramelization of the sauce and lovely burnt smell. 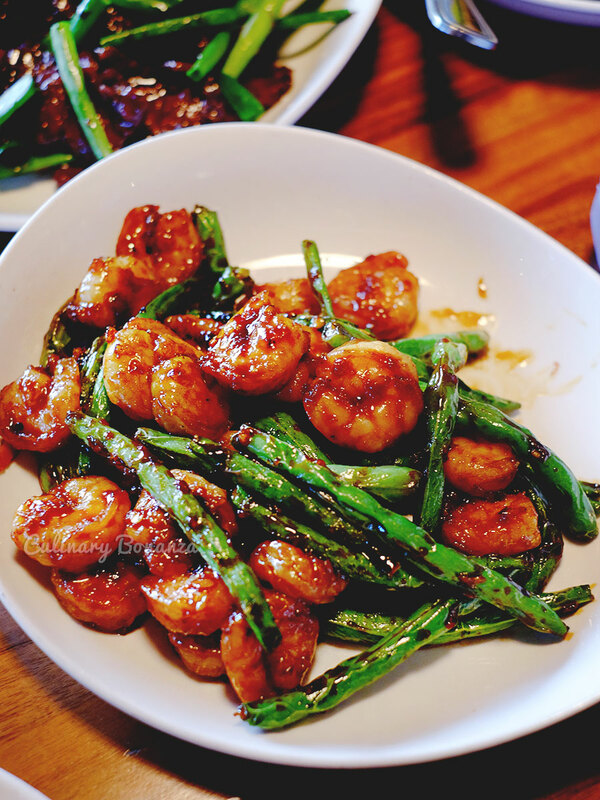 I would come back to P. F. Chang’s just for this exact same dish. Remarks: couldn’t tell the mala sauce in this dish, so it ends up being just another shrimp dish. The shrimp itself is tasty and has that delightful springy / crunchy texture. 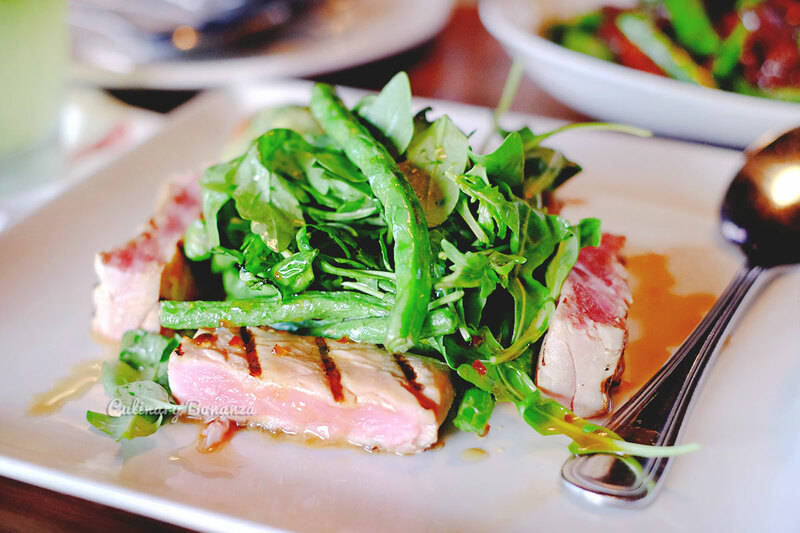 Soy-marinated ahi tuna & seared to medium rare, served with fresh green beans & baby arugula, tossed in chili lime dressing, served with wasabi guacamole. Remarks: this dish has a lot of potential if the tuna can lose the fishy odour. The salad and juicy crunchy greens turns out to be the highlight of this dish, instead of the tuna, sadly. 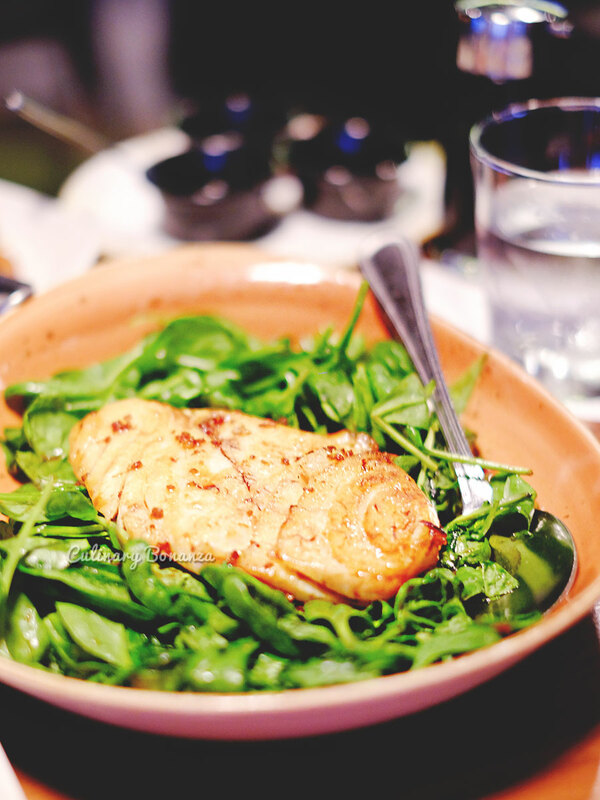 Filet of sea bass marinated in steeped oolong tea & ginger, served on a bed of wok tossed spinach. Remarks: some parts of the sea bass was buttery and juicy, but some other part is quite dry and fibrous. It was either unevenly cooked, or there’s perhaps another reason for that. Could use more generous marinade on top of the fish. I quite like the tender spinach accompanying this dish, although it end up tasting a bit bitter. I suggest serving with other greens such as asparagus perhaps? 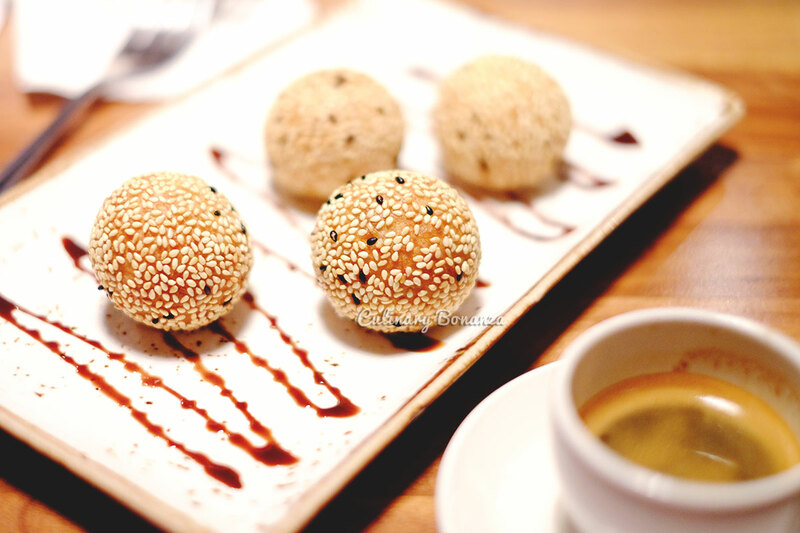 Traditional rice balls, rolled with chocolate or nutella center & coated with sesame seeds, quickly fried, and drizzled with chocolate sauce. Remarks: At first this dessert seems interesting because of the description and it’s not commonly found except in Asian fusion restaurants. But I’m disappointed with the quality, which fell below my expectation, the mochi left some bitter after taste for some reason. Fortunately, other than the buchi the other desserts I tried (which our friends ordered): the Great Wall of Chocolate and Banana Spring Rolls tasted much better than the mochi, although I wonder if the portion alone is enough to make them as main course LOL! 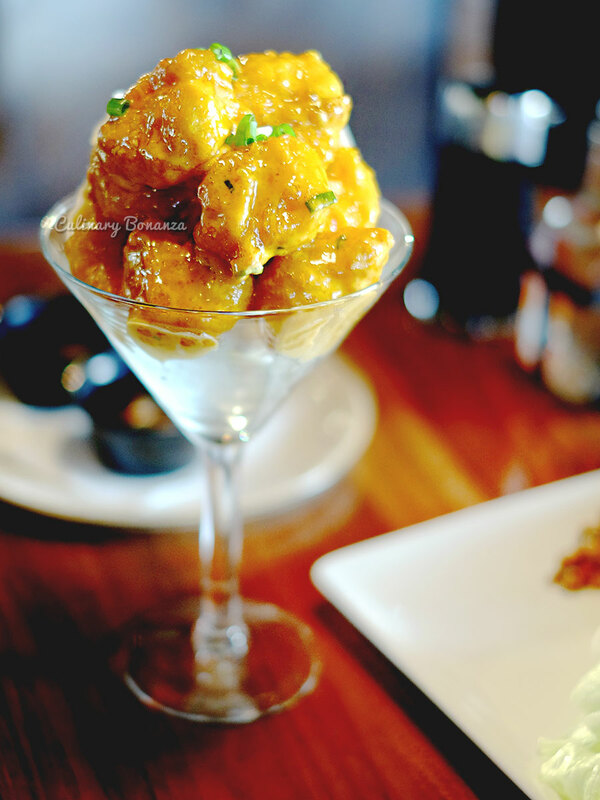 What I like about P. F. Chang’s is that is has several great signature dishes that I’ve never seen yet in Jakarta such as the VIP Duck and Dynamite Shrimp. Besides that, I'm quite impressed with the staff’s offer to mix the sauce at the beginning of the dinner. Food also comes served quite quickly, like they could a few dishes at a time and all are still quite warm. This reflects the good coordination in the kitchen. Would you like us to mix the sauce for you Sir / Ma'am? 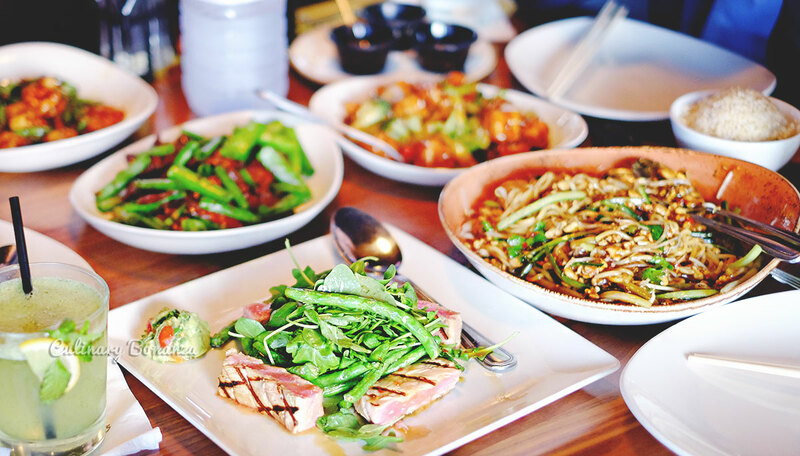 That being said, to be a strong contender to the existing modern asian diner niche, P. F. Chang’s may have to consider running a full fledged bar, and serve alcoholic beverages and wine on the drinks menu. It would only be considered reasonable for a place like this in Jakarta to charge 2/3 the price of the price in Dubai, because that's what the competitors are currently charging too. To make it stand out in Jakarta (especially against its direct competitors), it needs to be located at a great area, one of such would be Senopati or Gunawarman and in some certain high end shopping malls and often frequented by families in Jakarta, such as Grand Indonesia, Central Park or Pondok Indah Mall.